Japan remains ranked World No. 1, Korea climbs to No. 3, Chinese Taipei dropped to No. 4. LAUSANNE, Switzerland -- The World Baseball Softball Confederation today revealed the updated 2016 standings in the Official WBSC Baseball World Rankings, which weigh a country's entire National Team programme (from U-12 to Professional) in international competition. The Top 10 sees five position changes with the most recent world rankings update, while 59 of the 71 ranked nations either moved up or down the ladder. Four continents (Asia, Europe, North- and South America) are represented within the Top 10, and five (Oceania) within the Top 20. Japan remains ranked No. 1 in the world, following a second-place finish at the U-15 Baseball World Cup 2016 earlier this month in Iwaki, which boosted the nation's total ranking points from 5,154 to 5,515. The U.S. U-15 National Team earned the bronze medal in Iwaki to maintain the United States' No. 2 world rank -- just 62 points behind Japan. The Republic of Korea has risen to a historical high at No. 3 in the world, continuing on the momentum of winning the flagship Premier12 2015 global championship. 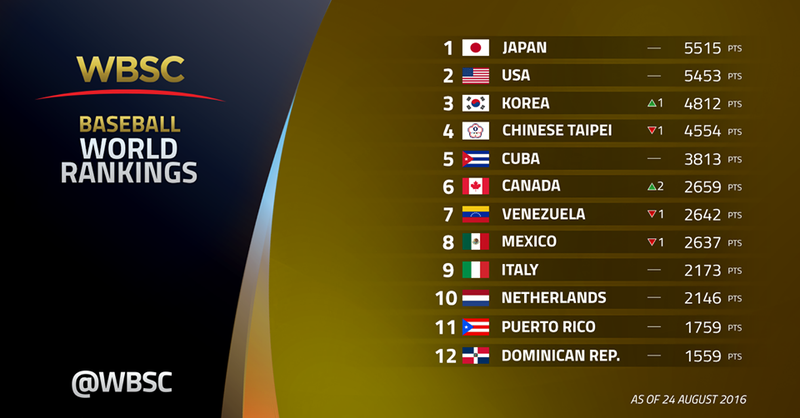 Chinese Taipei, with points expiring from a third-place finish at the U-15 Baseball World Cup 2012, has dropped to No. 4. Former world No. 1 Cuba holds its position as No. 5 in the rankings, but the two-time defending U-15 world champions have advanced closer to the No. 4 position while increasing the lead over the No. 6 position. Canada has moved up two spots in the world rankings to No. 6, bypassing No. 7 Venezuela and No. 8 Mexico, both of whom have fallen one spot. Italy, at No. 9, remains the top-ranked country in Europe, ahead of No. 10 Netherlands. The top-ranked nation in Oceania, No. 13 Australia (1,555 pts. ), has moved within four points of the No. 12 ranking (Dominican Republic - 1,559 pts. ), which is the cut-off for qualifying into the next edition of the Premier12 in 2019. 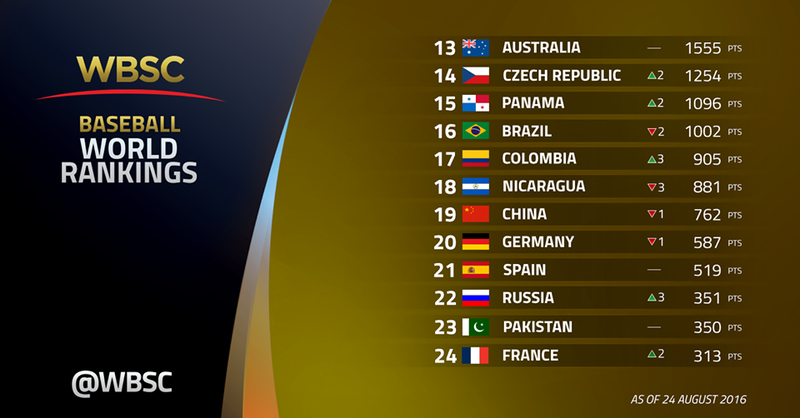 Elsewhere within the Top 20, Czech Republic and Panama have each advanced two spots to No. 14 and No. 15, respectively. Panama finished fourth at the U-15 Baseball World Cup 2016 in Iwaki. Colombia has made the biggest jump within the Top 20, advancing three spots to No. 17, following a sixth-place finish in Iwaki. Serbia has gone from unranked to making the nation's debut in the 2016 rankings at No. 51, having won a 2016 European C-Level Championship. Georgia also makes the nation's debut in the 2016 world rankings at No. 66. The WBSC Baseball World Rankings reflect a 4-year cycle and a data set of more than 1,000 international contests dating to mid-2012. Points generated from recent competitions include the WBSC U-15 Baseball World Cup 2016, the U-18 Baseball World Cup 2017 European qualifier, and the U-12 Baseball World Cup 2017 qualifiers in the Americas and Europe. Expired points from the current world rankings include points derived from the U-15 Baseball World Cup 2012 (won by Venezuela), the East Asian Baseball Cup 2012 and international friendlies in 2012. The WBSC Baseball World Rankings will next be updated following the U-23 Baseball World Cup in November, which will award the largest amount of ranking points on the 2016 international calendar.